The Memorial Candle Program has been designed to help offset the costs associated with the hosting this Tribute Website in perpetuity. Through the lighting of a memorial candle, your thoughtful gesture will be recorded in the Book of Memories and the proceeds will go directly towards helping ensure that the family and friends of Virginia Austin can continue to memorialize, re-visit, interact with each other and enhance this tribute for future generations. 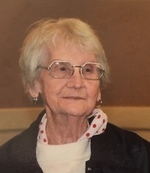 Virginia Elaine Austin, 93, of Mineola, TX passed away on January 30, 2017 in Tyler, TX. She was born on December 14, 1923 to the late David Lewis and Myrtile May Lewis of Enid, OK. She was born in a small farm house where she was the youngest of twelve children. Virginia is survived by a sister of ninety-five years, Pauline Lewis Windsor of Panama City, FL; daughter, Gwynda Elaine Milner; two grandchildren, Cody and Shea; eight great grandchildren and three great-great grandchildren. She was the owner of Austin Cleaners in Quitman, TX and had lived in Wood County for over thirty years. She will be missed greatly. Memorial services will be held at Mineola Seniors Community, Saturday February 4 at 2PM. To send flowers to the family of Virginia Elaine Austin (Lewis), please visit our Heartfelt Sympathies Store.